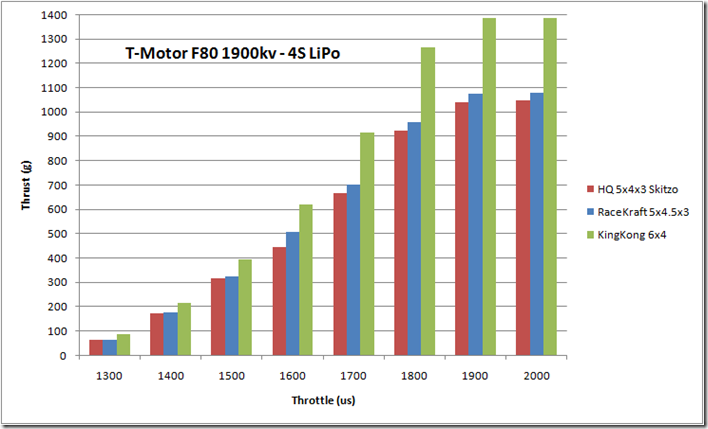 DroneHiTech.com – T-Motor F80–Should you go for it? 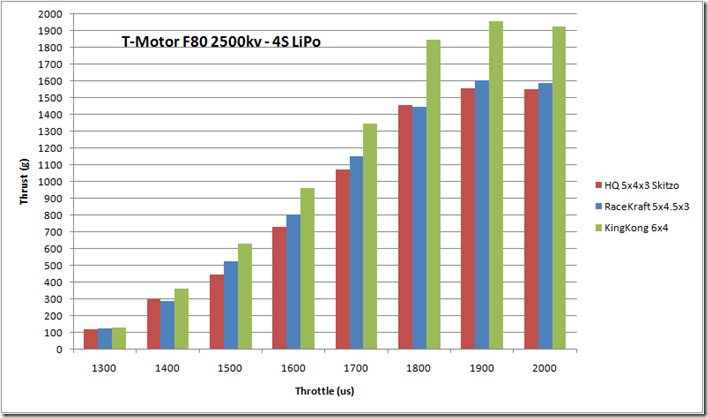 T-Motor F80–Should you go for it? If you are looking for motors for your next race drone, you probably already heard about the F-Series motors by T-Motor. 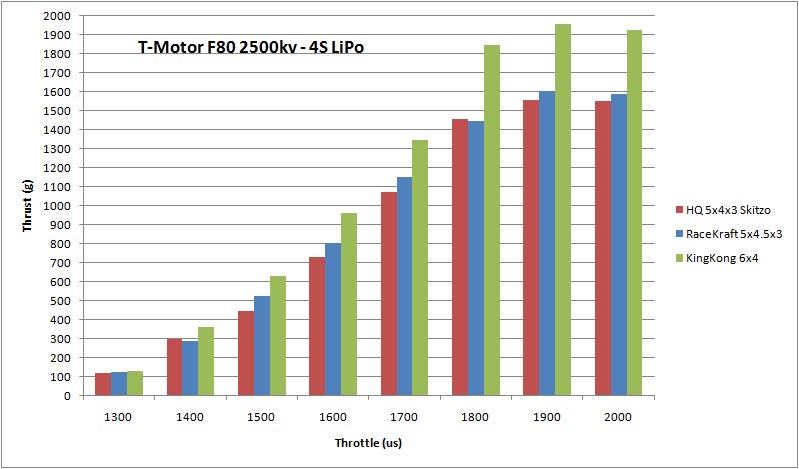 We have tested the F20, F40 and F60 already and thanks to T-Motor finally got our hands on the new F80 motors. We are going to make some thrust tests and compare the F80 to the F40 and F60, so you can find the best one for your race drone. 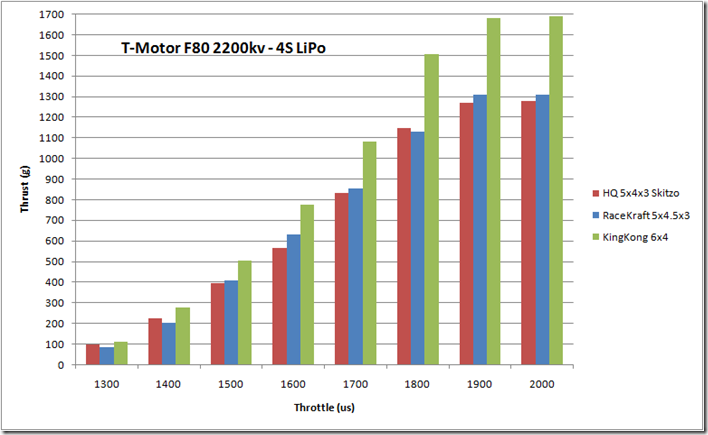 The F80 is a 2308 type motor and so the biggest and heaviest motor in the F-Series. The build quality is as always great and we haven´t experienced any issues with broken shafts etc. The wires are long enough for any 250mm race quad and T-Motor used 18AWG wires. The design isn’t changed a lot compared to the F40II motor, but the F80 features arc magnets. The hollow steel shaft has a diameter of 5mm. Mounting holes pattern is M3 19x16mm. On all motor thrust tests, we have used three different propeller types: KingKong 6×4, HQ5040 3-blade Skitzo and HQ5045 3-blade. For the 4S LiPo tests, we used our best performing Aikon SEMF 30A ESC and for the 6S LiPo tests the new 6S version of the Aikon. The 1900kv version of the F80 is great for a 6” prop. You will not only get the best thrust result (almost 1.4kg), but also the best efficiency – 2.85g/W. The motor is absolutely cool at the end of the test, so you should no worries of burning it. The F80 got warm after the static thrust test with the KingKong 6×4 propeller, but it shouldn’t be a problem in flight. You may be concerned about you ESC and battery because the current reached 42A. Using the 5” propeller it was around 32-35A, which is fine for every 30A rated ESC. Now let examine the results with a 6S 1300mAh Nano-Tech battery. We have only used the popular Skitzo HQ5040 3-blade prop. First of all do not wonder why the thrust on max throttle is lower than on 1900us: battery voltage drop. During the test with the 2500kv version, the current reached 55A and voltage dropped to 18V, which almost killed my 6S battery. Should you get the F80 or better stay with F40 and F60? If you are going to use a 6” propeller, there is really a difference in the thrust ratio. However, on a 3-blade 5” prop there is almost any. 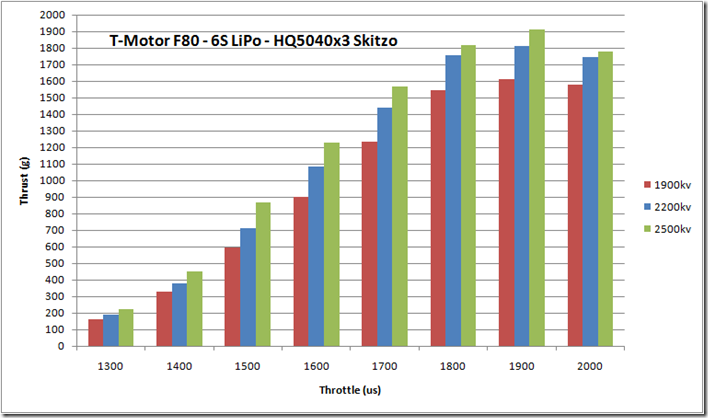 If you are interested in more F60 thrust results, check here. 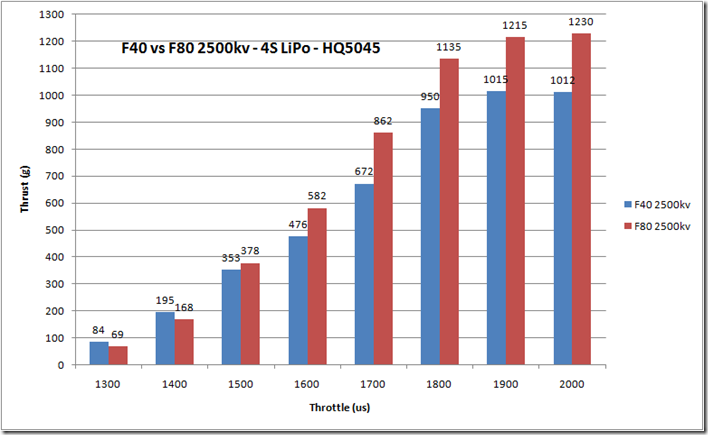 Below you can also find a comparison between the “old” F40 2500kv and F80 2500kv with a standard HQ5045 propeller. The difference in the motors weight was already deducted from the thrust results of the F80. As you can see there is about 200g more thrust with the F80 motor, which will give you a lot more speed. However, the additional weight of 55g (for 4 motors) will decrease the flight time of your drone. Update: Below you can find the complete exported thrust data from the RCbenchmark Tool. 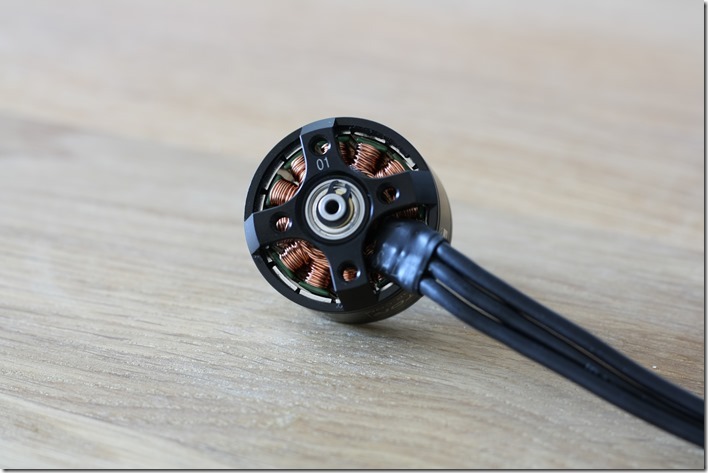 The F80 motors, as well as all F-Series motors, have great build quality. 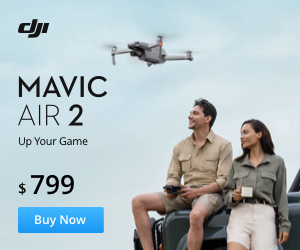 It is up to you, using the provided test results, to find out which kV-version is the best for your drone. 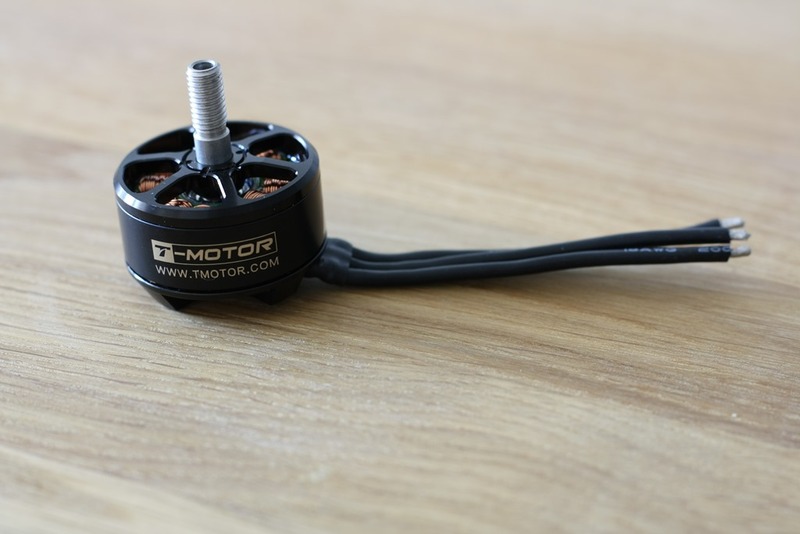 All T-Motors are available at Banggood and are genuine. Update 2017.10: Check out the newest review and comparison of the F40 Pro and F40 III. Thank you for reading! If you like our articles, please follow us on Facebook and stay tuned! Thanks for a very informative review and post. I was wondering, according to the specs on T-motor website, the kv1900 seems to actually be of higher power rating. Also the current rating on all of them are way below 55A. 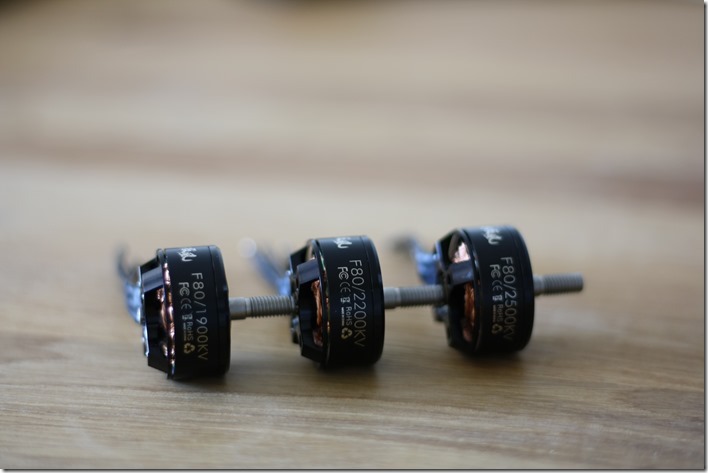 From their specs, it seems that the 1900KV can go near 2000g but not the 2200kv and 2500kv ones. What do you think? Hi, all of the motors can go near the 2kg. It just depends on the propeller and battery type you are going to use. The 2500kv version can easily reach the 2kg with a HQ 5″ 3-blade prop on 6S, if the battery is a healthy one. On what configuration you are planing to use these F80? Any idea on how many amps reached during the thrust test of the F80 1900kv on 4S with KingKong 6×4 props? Whether the F80 was tested on 7 inch 3 blade propellers? I’d like to put a F80 2500kv on a flying wing with 4s lipo 75C, do you think I can use a 7 inch prop or something will go wrong ? What do you think ? If you used a 4S battery as you said, then why in the excel sheets the voltage is greater than 14.8V? Thanks for doing these test. I would like to see the f80 1900kv on a 7″ prop with 4s lipo. I think it may be a really good setup. I am really impressed by the performances of such motors of specific power. Usually, high torque motors are allowed today to develop between 3 to 6 kW/kg. This motor, according to data sheets, is able to develop around 25kW/kg. Same thing for the current density which is limited to 5-10 A/mm² with forced convection today. Here it seems the current density reached is around 60 A/mm². Here is now my question, you who tested these motors, did you try to make it works in continuous rating during a long time? I mean maximum speed and torque for, for exemple, 10 mn ! Did it burn? This motor would not survive at these power levels. It does not have the mass to cool the motor at high watt loads. Just take my experience of using a 5s lipo and a dal 6×4 prop, at landing the motor was 130f. That was varying the throttle and only hitting full throttle a couple times. I would say that full throttle for more than 5-10 seconds and I would have burnt a winding. These new T-Motors are great and can handle huge burst currents, but are still limited by the mass and cooling the motor can do. I have difficulties to buy the F80 KV1900. In the regular stores, they do not have it or the price is very high. In getFPV says it is discontinued. Five days ago I order four directly from T-Motor, first on the website, but was some problems and finally on the eBay account. Today I just received a message saying that my order cannot be fulfilled because they have a(nother) problem. They have not specified what kind of problem. I was wondering if you could guide me in looking for an alternative to these engines. I am looking for Trust and maximize flight time. Theoretically, (www.ecalc.ch) in a 280 drone with 6030 props, AUW 848g and 2×1550 LiPoo I get 20m fly. Very helpful review, thanks for taking the time to complete it. Looking for a pair of hi performance motors for a flying wing twin puller with 6″ props using 3-D printed nacelles. It’s just a fun project. The wing is a Crashtesthobby Rebel 14 40″, EPP, carbon spar, shock cord, lots of glass fiber tape, fully laminated – no ordinary wing. Twin 3-d printed puller nacelles, 4S 1800mAh 75C Tattu. With FPV gear – probably over 600g. Built a dozen CTH wings, rock solid. Looking for 130mph+, so hi thrust but sensible amp draw. Your comments on the F801900kv suiting a 6×4 caught my eye, so say max amps around 30-35 for each motor for 20sec bursts and the battery should not cook. What would be your view? 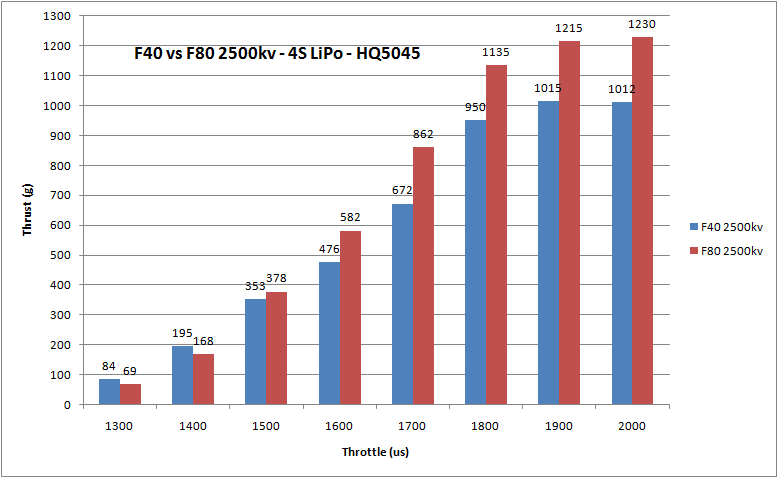 The Tiger site shows the F80 PRO 1900 specs as just for 6S, and the only 4S on their chart was the 2500KV, but your spreadsheet shows 6×4 on 4S for the 1900, so that’s useful. I’m limited to the amp draw from the one battery. I normally use APC props. The battery should be absolutely fine for 70A burst. I was going to propose either the F60 or F40 versions, because you need two of them. 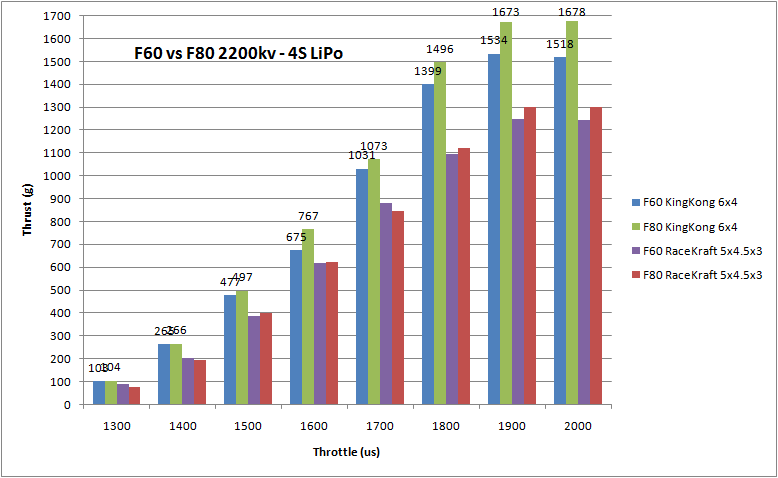 However the current F60 Pro III is coming in two version: 2500kv and 2700kv. 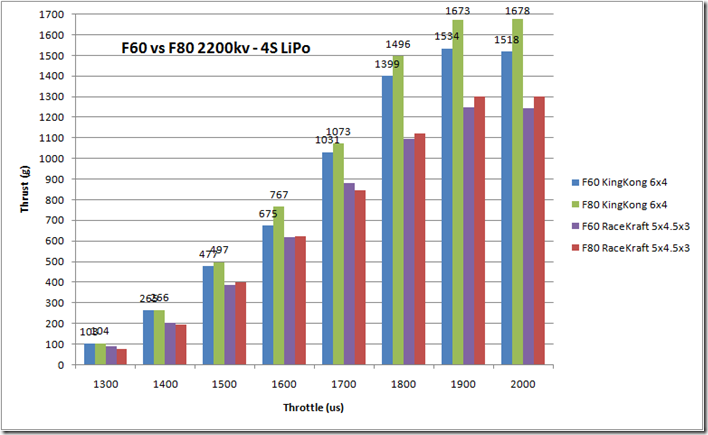 On 100% throttle with 4S battery and 6″ propeller, it will probably burn… I have tested the previous version of the F60 Pro with 6″ and 4S (2200kV) and the max thrust was 1.7kg at 45A. At about 70% throttle, the result was 1.24kg and 27A. So by having two of these motors, you will have very powerful fixwing and probably not going over 70% throttle. Hope this help you with your decision! I’m coming back to your spreadsheet for the F80 1900 showing 1388g thrust at 30A on 4S and 6×4. I can also experiment with one motor and 6S. There are too many variants to make an easy decision! Thanks again. You are welcome. If I get the chance to test these new F60 Pro III, will provide you the results. I had meant to ask – any reason you use KingKong 6×4 props rather than the well known APC? I also came across a comment on the Finwing site that said ‘for 6″ and 6S, use the the quad propeller rather than APC’. I’m wondering why APC was not recommended by this site either. I bought 3 F80 motors for fixed wing use with 6X4, so these questions are of interest. Good question about the well known APC propeller. Is it also a 6×4 prop? They may recommend a quad propeller just because on 6S, the APC may generate much more thrust and be more power hungry. Therefore it may be too much for the motor to handle the heat and burn. APC is just a well-known brand and the quality of the props are good. Everything else is just physics. I will not be worried to use KingKong or APC or any other 6″ prop if you don’t push the motor to more than 70% throttle. I have used the f80 1900kv motor on a ritewing 38″ wing with full size fpv equipment. With a 4s lipo it will swing an APC 7×5 if you want max thrust. For max speed on a 4s I used the APC 6×4 or dal 6×4, I can use full throttle with either 6×4 prop without fear of burning the motor. I have tried a 5s with the dal 6×4 but temps was hitting 130f and I didnt test any more. Slightly more efficient with 5S, but I don’t have a small enough pack to try in flight. That is awesome I will be interested to see the GPS data on speed. The 6×4 does look and feel faster but I have no data to back it up.